Tony Romo is only 8 1⁄2 months older than Eli Manning, but he will begin the 2017 season in a CBS booth in Nashville while Manning leads the Giants against Romo’s old Cowboys team. So who better to appreciate Manning’s staying power than Romo, who took a beating in his 14-year career and played in only five games in his final two seasons? “He’s a legend of the game, and he’s still playing,” Romo said. “One thing that I really think is special, though, and I’ll talk about this during the season, is the great quarterbacks have an ability to last through the lean years, when the team kind of has turnover. A lot of guys can make it through years when you have really good football teams. But if you’re a great quarterback, you make it through years where your team is not very good but they ask you to carry it and still be competitive and win. Manning came out of a four-season playoff drought last year with an 11-5 record and a wild-card berth, and now has a team widely regarded as a Super Bowl contender. The complicating factor is that he is 36, so the Giants’ window to win a third Super Bowl with him presumably is closing. But many of the network TV analysts who follow him said this past week that given his durability and an era in which the Patriots’ Tom Brady is going strong at 40, that window could remain cracked open for a while yet. Manning isn’t even the oldest starting quarterback in his own home stadium. The Jets’ Josh McCown is 38. “Quarterbacks are playing longer, so he might play another six years,” Fox’s Cris Carter said. “Peyton, it was an injury thing that forced him out, or he’d probably still be playing. So Eli’s genetics are strong. He doesn’t get hurt. He still loves to play. He’s got a great organization around him. He’s got talent, weapons. 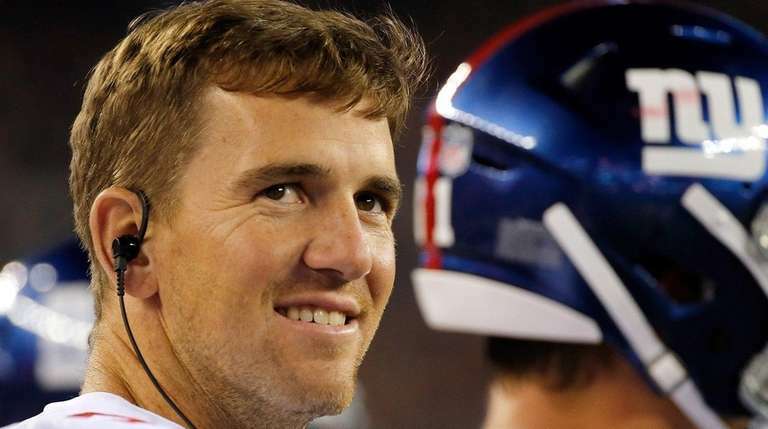 CBS’ Rich Gannon, who retired as a quarterback at age 39, said, “I think Eli falls into that category of these guys who take unbelievably good care of themselves. I think playing at 40 no longer is a stretch at that position. Look at his durability. He doesn’t take unnecessary hits. He knows when to get rid of the football. After watching the Giants in the preseason, ESPN’s Jon Gruden believes that despite worries about the offensive line, they have what it takes to win, and he has no doubt that they have a quarterback who can do the job. “I don’t think they have the heir apparent ready to play in New York at the quarterback position based on what I saw in preseason,” he said. “I don’t even know who they’re going to use as their backup, and Eli is 36. But we’ve got a guy down the street in New England playing in his 40s. That is more than most NFL teams can say. “I mean, just look around the league right now,” NBC’s Cris Collinsworth said. “There just aren’t many of those guys. Every year I kind of take a count as to how many guys playing the quarterback position I think will actually win the Super Bowl. Collinsworth will be the first game analyst to get a crack at Manning this season on Sept. 10, but not before his NBC studio colleagues, Rodney Harrison and Tony Dungy, have their turn. Harrison echoed the notion that Manning is not necessarily in his final year or two of effectiveness. “This guy doesn’t really get hit,” said Harrison, who as a Patriots safety defending David Tyree in Super Bowl XLII found himself in the middle of Manning’s most memorable play. “That’s kind of what I look at. It’s not like he’s had major, major injuries. Tom Brady has proven you can play well into your 30s and right into your 40s. Eli, as long as that offensive line protects and he doesn’t sustain a major injury, as long as his spirit, his mind, his body seem OK, I think he can play as long as he wants to play. “But I think there comes a point where he has to get this team to the next level. The Giants went out and spent a lot of money. I know his name is Manning and he has a lot of history, future Hall of Famer, two Super Bowls, beat the Patriots. But at the same time, you want that level of consistency from Eli. Said Dungy, who coached Peyton Manning to his first Super Bowl victory, with the Colts: “I really don’t like that phrase: ‘When is the window closing?’ We don’t know when the window is going to close. I think given good health, he can play for a number of years, but who knows? It may go this year. It may go next year. So you’ve got to do it.